Exactly one hundred years ago, something spiritually remarkable was happening in Central Europe. A figure had emerged with the most profound insight into the deepest mysteries of the human experience: death, reincarnation, the existence of higher worlds and the destiny of human evolution. He was highly educated in Western philosophy and science, widely read in cultural and artistic matters, and possessed a magnetic gift as a public speaker and writer. Over the course of the next twenty five years, he gave over six thousand lectures — none of them the same — wrote twenty five books, and founded major new impulses in education, agriculture, medicine and numerous other disciplines. A century later, the schools that developed from his spiritual insight into the unfoldment of the child constitute the world’s most widespread, independent approach to education. His organic approach to farming and agriculture preceded the back-to-the-land movement of the Sixties by half a century and is now widely practiced. And villages inspired by his work for “those in need of special care,” physically challenged and disabled adults and children, are found on every continent. Surely such a figure would be a household name among the millions in North America who consider themselves part of the consciousness community — people concerned with the very issues to which this individual had devoted his life. It would be hard to imagine that someone so dedicated to serving humanity and so successful in his efforts would be mostly unknown to the many who take pride in their commitment to spiritual and social renewal. Yet that is exactly what has happened. Somehow, Rudolf Steiner — perhaps the most spiritually gifted and accomplished figure of the Twentieth Century — remains marginalized by most cultural creatives today. A man who felt his destiny was, above all, to give to the modern world a correct and scrupulous understanding of karma and reincarnation, has been largely forgotten as a spiritual teacher while the Tibetan Book of the Dead and all things Buddhist have become hip and fashionable. How can this be? Clearly, it didn’t help that Steiner died in 1925, that he never came to America, and that all his lectures were given in German. New readers can be easily overwhelmed by the sheer volume of his work, the difficulty of knowing where to start, and the frequent use of unfamiliar terms. To be sure, Steiner’s books are never easy reading. Each demands the intense mental effort of grasping totally new thoughts that seriously expand the mind and the imagination. The result, however, is that the reader emerges with a magnificent conception of the journey of spiritual evolution that encompasses the mystery centers and civilizations of the ancient world, the medieval and renaissance mystics, the full spectrum of philosophy, and the attainment of knowledge of higher worlds. An awakened reader also develops an overwhelming sense of the vastness of human existence. When we read Steiner on what he calls “the life between death and rebirth” we are not perplexed by arcane accounts of the various “bardo” states that often require a lama for explication. Instead, he paints a lucid picture of the moment of death when a vast tableau of our life rises before us. This is followed by the phase he calls kamaloca in which the soul relives its life backwards, this time infinitely more sensitive to the effects produced on others by its actions. This is the moral purification or ennoblement of the soul that has come down to us in twisted form as purgatory. After this extended period when we truly grasp the consequences of our actions, the soul is said to journey out into devachan, the sphere of the planetary intelligences, imbibing cosmic wisdom until the “midnight hour of existence” is reached and it begins its journey towards rebirth. Then, aided by the magnificent super-angelic beings that have come down to us in meager and distorted form as the plump little cherubims and seraphims of church decoration, we shape the contours of our future incarnation to balance the actions of our previous life. As Saul Bellow, for years a serious student of Rudolf Steiner, has commented, this is a view of human life and death that is hair raising. And it must be said that even if only five per cent of what Steiner describes is true, then our lives and deaths are the wildest cosmic ride any of us could ever ask for. Now, how did he know all of this? Most mortals have a hard enough time just making it through the day without finding time to contemplate these spiritual subtleties. 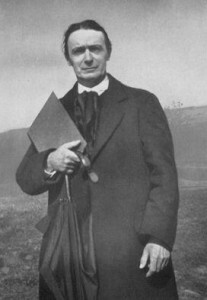 Rudolf Steiner, however, was blessed by clairvoyant vision from the age of nine when he first became aware of spiritual beings beyond the material plane. But he was far from a woolly minded mystic. Despite his humble beginnings as the son of a railway official in a small Croatian village, he went on to pursue a rigorous education in technical and scientific subjects in Vienna, and then to receive a doctorate in philosophy. At the age of 24, his intellectual gifts were recognized and he was invited to edit the scientific works of the great German poet and playwright, Goethe. He then spent years immersed in scholarship in the Goethe-Schiller Archives in Weimar before moving to Berlin and teaching at a workers’ educational institute, along with figures like Rosa Luxemburg. It was only after the Twentieth Century had begun and he had turned forty that he began to speak openly of esoteric matters. Until that point, he had been known as a philosopher, scholar, writer, editor and cultural commentator. Suddenly, he completely shocked his contemporaries by giving detailed, sophisticated talks on the most profound spiritual subjects that clearly displayed a level of knowledge unrivaled by anyone at that time in the Western world. It is difficult for most of us to imagine what the early years of the last century were like. Many people of cultural influence and social prominence were strongly drawn to the new spiritual wisdom then appearing through people like Steiner in Central Europe and Gurdjieff and Ouspensky in Russia. It was a time of immense optimism and Steiner rapidly drew to himself a significant following as he began a tireless series of lectures all over Europe. The new century seemed to promise unimpeded progress and work was begun in Switzerland on a striking new building, the Goetheanum, which was intended to become a center for the deepest spiritual mysteries. Unfortunately, the outbreak of the First World War intervened, an event that Steiner observed at close hand through his contacts with a high-ranking member of the German General Staff. His views on how it came about, partially contained in the book The Karma of Untruthfulness, contain much that is of value to us as we contemplate how we have been manipulated into the war in Iraq. Steiner was never blind to the dark side of existence. In fact, he felt strongly that the development of a deeper understanding of evil was an essential spiritual requirement of the modern age, and he did all he could to awaken people to the increasingly powerful influence of regressive, materialistic impulses. After the war, he continued to teach widely and write. He discouraged any tendency of others to view him as a guru, believing that such a role was no longer appropriate in the modern age when the spirit of individual freedom is paramount. His constant emphasis was on the possibility of awakening through meditation higher faculties that slumber in the souls of all humans, and the crucial necessity of doing this if people were to respond to the urgent spiritual requirements of the day. He saw his teaching as a contemporary successor to the holy wisdom understood in the ancient cultures of India, Persia, Egypt and Greece. Then it had been confined to mystery centers like Delphi and Ephesus where only the carefully selected could be initiated into the deepest mysteries of existence. Now, however, it was available to all and the opportunity was presented to humanity to lift itself beyond the materialism of the Nineteenth Century to a renewed sense of membership in a spiritually alive cosmos. Now we could bring to the inner world the same rigorous, objective, scientific spirit that we had applied to the outer world, and we could do so with autonomy and without superstition. However, if the world failed to awaken, he foresaw dire consequences that might abort our evolution and deny the very purpose for which human beings had come into existence. His work attracted the hostile attention of the early Nazis and they violently disrupted a number of his lectures. He, however, refused to be cowed or deterred in any way. In the last five years of his life many people began to approach him to ask how Anthroposophy or Spiritual Science, the titles he gave to his work, could be applied to practical realms. Farmers, teachers, doctors and priests all longed for renewal in their fields and Steiner’s response was gracious. He had only to be asked. Then he felt spiritually bound to give all he could. His lecture series on education, offered originally to workers and management of the Waldorf tobacco factory in Stuttgart who wanted to start a school, became the seed of the worldwide Waldorf School movement. His talks to farmers in Silesia became the source of the whole movement for Biodynamic agriculture that he viewed as essential if both human and environmental health were to be maintained. He even gave a wonderful lecture series to professional beekeepers as he could see that the decline of the honey bee presaged the demise of healthy food and the rural environment. He was simply decades ahead of his time — a true forerunner and messenger of love and freedom. But what was he like as a person? Did any whiff of scandal ever emerge from his life, as it has so often with so many leading spiritual figures? From the many accounts written by those who knew him, he was a warm and extremely helpful person of immense integrity whose weakness may simply have been a great willingness to give private time and counsel to the many who asked for it. Despite the photographs that always portray Steiner as a stern faced, serious individual, he was apparently extremely funny. He was also a man of artistic talent as a sculptor and architect who saw the arts as a vital bridge between the material and spiritual worlds. Why do we know so little about this extraordinary individual almost eighty years after his death? It’s true that the Anthroposophical Society has branches worldwide, Waldorf Schools proliferate, Biodynamic farming is widely practiced and respected, and there are literally thousands of initiatives all over the planet inspired by his work in fields as varied as socially responsible banking, treatment for drug addiction, herbal and homeopathic medicines, even puppet making. But the anthroposophical community has, until recently, tended to hold itself somewhat apart from the rest of the holistic movement, perhaps because Steiner’s legacy is so all encompassing that it can appear complete in itself, requiring little outreach to others. Steiner was certainly possessed of a comprehensive spiritual genius, but we know him today mostly through the practical dimensions of his work. His stunning spiritual research into higher worlds, his encyclopedic knowledge of esoteric wisdom, and his profound insights into the working of the human soul all remain strangely ignored by a public yearning for deeper truths. We desperately want to know the truth about reincarnation, we hear frequent references to angels, we remain fascinated by the remnants of ancient mysteries still visible in stone circles and Egyptian monuments. Yet the man who, more than any other figure of the last century, has the capacity to enlighten us on all these matters remains mostly unread in holistic circles. The more than two hundred books by and about Rudolf Steiner available in English constitute an amazing treasure trove of sacred wisdom. Casual reading they are not, but the rewards far outweigh the effort involved. While academic philosophy remains hopelessly detached from real world issues, we have in Steiner a truly modern spiritual philosopher who felt that he incarnated with a crucial mission to return to the world the kind of knowledge for which human hearts increasingly cry out. At a time of immense international danger, when war and terrorism dominate the headlines and a sense of foreboding hangs heavy in the air, we may find ourselves increasingly thankful that this seemingly distant figure, with words of acute relevance to the present time, showed us how to grasp and lead the struggle for the soul of humanity in which we now find ourselves engaged. Ralph White is co-founder of the New York Open Center and editor of LapisMagazine.Org.